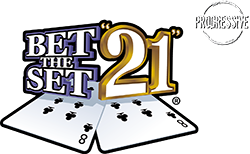 Bet the Set "21"SM Progressive is an exciting side bet for Blackjack that considers the first two cards the player and the dealer receive. To begin each round, players make their standard Blackjack wager, the Bet the Set wager, and the progressive wager. The dealer then follows house procedures for Blackjack. Once each player has received two cards, the dealer settles all Bet the Set wagers according to house procedures. To maximize game play for single-deck Blackjack, we recommend using a DeckMate2 single-deck shuffler. To maximize game play for multi-deck games, we recommend using an one2six continuous shuffler or an MD3 multi-deck batch shuffler.